I went to an Allen Stone concert recently at the Great American Music Hall in San Francisco. One of the openers was Yuna, who I had heard of a while before the concert and loved her music, but when she sang live it was even more amazing! Not only do I love her voice, but her fashion style is very unique. 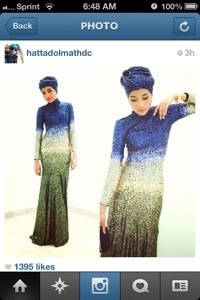 I recently started following her Instagram and she posted the most beautiful dress made by hattadolmathdc that is so stunning! I love the sequin head wrap that goes along with it too!